Brushing your pets teeth is not the easiest thing in the world to do, especially if your pet is not used to you handling it near its mouth. By getting your pet used to you working around and in its mouth at a young age, you will make the process of tooth brushing go smoother when your pet is older and needs brushing. Proper restraint is the key to getting your pet to cooperate. We will show you some techniques that can be used by one person or two people in cooperation. A good time to start is when you are watching TV at night and your pet is in your lap. Get your pet used to your hands around its face, and eventually insert your finger in its mouth. Dipping your finger in food that tastes good to your pet is helpful. Eventually you will be able to use the finger brush to gently brush the teeth. If you are patient, take your time, and make it fun, you stand a good chance of being successful. The key to restraining a small pet for tooth brushing is to use as little force as possible. One person can restrain while the other brushes the teeth, although one person can usually brush a small pets teeth alone. Start by putting your friend on a table while talking in a soothing voice and petting it. Have your tooth brush or finger brush already on the table. Hug your pet to you with one hand while simultaneously holding its head and neck gently with your other hand. This method works well with many cats. If your pet uses its front legs to push your hands out of its mouth you can solve this problem by holding the front legs, always with one of your fingers between the legs. A towel can be used for some additional restraint. Wrap it loosely around the body and hug your pet to you. If necessary, the front legs can be held also. It is sometimes advantageous to include the front legs in the wrap. This towel will need to be wrapped tighter if you want the legs to stay in. Once restrained you can introduce your finger, a piece of gauze, a finger brush, or a tooth brush into the mouth. Rub in a gentle motion while talking in soothing tones to your pet. You can turn the head gently or completely reposition yourself to do the other side. Proper dental care involves more than just scraping tartar off the teeth. Thorough dental care involves scaling, probing and polishing. These can only be accomplished on an anesthetized pet. It is not realistic to think that somebody can scrape tartar off of an awake pet and be as thorough as we can on an anesthetized pet. When these procedures are performed properly we can reverse the gingivitis process and keep the teeth and gums healthier for a longer period of time. Scaling teeth is greatly facilitated by a special instrument called an ultrasonic scaler. By vibrating tartar off the teeth with the scaler we cause minimal trauma to the tooth enamel. In addition, the rapid manner in which it removes the tartar minimizes anesthetic time. The gentle nature of the scaler allows us to clean under the gumline and not irritate the gums. A special dental instrument is used to crack off large pieces of tartar before we use the scaler. This enables us to clean the teeth faster, another method to minimize anesthetic time. It also reduces wear on the ultrasonic scaler tip. The tip vibrates 18,000 times per second, and literally vibrates tartar off the teeth. It does not harm the enamel, and lets us clean the teeth faster than doing it by hand. It continually sprays water to minimize heat buildup which could irritate the gums. When the tartar is heavy, like this canine tooth, it takes longer to remove. To minimize any trauma to the tooth’s enamel or gum, we drip additional water on the area being scaled. Without the scaler this tooth would need hand scaling, a process that would take substantially longer. The ultrasonic scaler does a thorough job of removing the visible tartar. It also excels at removing tartar under the gumline where it can not be seen. This is a critical part of the scaling process. Only when this step is performed are the teeth properly cleaned. After scaling a special dental probe is carefully inserted under the gum to determine the degree of involvement. IF there is a pocket we will pack the opening with doxycycline to restore the gums to normal health. After the teeth are scaled and probed we spray them with chlorhexidine to further help eliminate the bacteria that are causing gingivitis. Polishing the teeth makes them look whiter. It also smoothes off the enamel surface and makes it more difficult for bacteria to adhere. Once bacteria get re-established, the cycle of plaque leading to tartar and eventually gingivitis gets started all over again. Please return to our Dental Page to learn much more about this important problem. A thorough approach is needed for a correct diagnosis of any liver problem. An organ like the liver that is so intimately involved with other important organs will exhibit symptoms that mimic disease in these other organs. Also, what initially might appear as a diseased liver is in reality a disease elsewhere in the body that is involved with the liver secondarily. This is why it is crucial to follow a thorough and methodical approach called the diagnostic process. Liver disease can occur in pets of any age. If it occurs in young animals we tend to think more of toxicity, a liver shunt or a viral disease like adenovirus in dogs, or FIP in cats. In older pets we tend to think more of inflammation and cancer, in addition to cholangiohepatitis and gall bladder problems, as the cause of the liver problem. Bedlington terrier’s, Skye terriers, Doberman pinschers, and West Highland White terriers get a problem with excessive copper accumulation that results from failure of normal biliary excretion of copper. Cocker spaniels have an increased incidence of chronic hepatitis. The recent use of pesticides, insecticides, and drugs might give us a clue. A history of poorly controlled diabetes mellitus might also clue us in to liver problems. Pets with liver shunts might have stunted growth and become depressed right after eating. In cats with hepatic lipidosis the history usually involves a lack of appetite (anorexia), especially if the cat was previously obese. This is a common symptom and one of the primary reasons pets are brought to us for an exam. The poor appetite that occurs in liver disease eventually leads to loss of weight. Improper metabolism of fat, carbohydrates, and proteins complicates the situation also. This is excess urinating and excess drinking of water. This can occur in liver disease, although several other important diseases cause these symptoms also, notably, kidney disease, Cushing’s disease, pyometra, and diabetes mellitus (sugar diabetes). Poor appetite and disruption in normal physiologic processes leads to this symptom. Anemia adds to this lethargy, along with ascites due to the discomfort it causes. Improper nutrition from a poor appetite, along with disease in the hepatocytes will cause this. If the biliary tree is prevented from secreting normal bile pigments into the intestine the stool will lack pigmentation and appear lighter in color. The normal clotting system is impaired since it depends on a healthy liver. Distended abdomen due to ascites or hepatomegaly. If the distention is severe enough breathing might be labored from pain or the pressure on the diaphragm. Sometimes blood is present in the vomitus (hematemesis), especially if a gastric ulcer is present. The ulcer comes from a complex interaction of histamine, nitrogen, bile acids, Gastrin, portal hypertension, and an altered mucous membrane lining the inside of the stomach. Due to distention of a diseased liver. This is known as icterus or jaundice. It is a yellow discoloration of any part of the body that is white. It can also be caused from a severe anemia, so it is not always liver disease that can cause this. Circling, head tilt, heap pressing, and seizures, particularly right after a meal. These might be due to excessive ammonia buildup, seen often in a liver shunt. 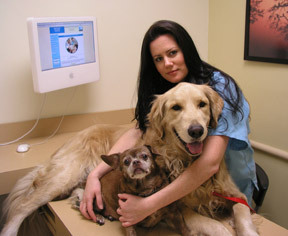 In a recent study it was found that dogs with liver disease can also have high blood pressure. This is called hypertension, and should be monitored to see if therapy is needed. Enlarged lymph nodes due to secondary bacterial infections or spread of a primary or metastatic liver tumor. Bruising (hematoma) might be observed under the skin, or when a blood sample is obtained. This is due to the liver’s affects on the clotting mechanism. Fever- a rectal temperature of greater than 103 degrees F could accompany liver disease when inflammation or infection is present. Skin infections and wounds that do not heal, or recur after antibiotics are stopped. Anemia might be observed by checking the mucous membranes for a normal pink color. Several tests are used as an aid in making this diagnosis. A CBC (complete blood count) and BCP (biochemistry panel) should be run on every pet 8 years of age or more, especially if they have any of the symptoms of liver disease. The CBC might show a decrease in the number of red blood cells (RBC’s). This decrease in RBC’s is called anemia. The white blood cell count (WBC) might be elevated (leukocytosis), normal, or decreased (leukopenia), mostly depending on the cause of the liver problem and how long it has been present. A change in the WBC’s does not necessarily indicate there is a liver problem. The biochem panel (BCP) might show an elevation in the liver enzymes. If a dog or cat has normal live enzymes on the blood panel, it still could be liver disease. This is because the liver cells are so scarred down (cirrhosis) that there are no enzymes in them to leak out into the bloodstream and detection by our blood panel. This is liver function test, not an enzyme test, and is not a routine part of the BCP. We will request this test when we suspect a liver problem, whether the enzyme tests are normal or not. This test is performed by taking a blood sample, giving a meal, then taking another blood sample 2 hours after the meal. Comparing the pre-meal and post-meal blood results gives us valuable information. The bile acids test is an accurate measure of liver function. A urine sample can give us important clues as to the existence of liver disease. The specific gravity might be below normal, an indication that PU/PD is present. Bilirubin might be present, a finding that is always abnormal in cats. There also might be ammonium biurate crystals, a sign of improper ammonia metabolism found in Hepatic Encephalopathy. Analysis of the fluid obtained from a pet with ascites can give valuable clues as to its cause. There are numerous causes to ascites, some of the more common ones are heart disease, liver disease, and cancer. This is a very valuable test in the diagnosis of liver disease. A sample of the liver can be obtained during an exploratory surgery or during an ultrasound procedure. The pathologist can look at the hepatocytes microscopically and determine if disease is present and what the cause is. This report is from a very ill cat. It is helpful to run a coagulation panel prior to any liver biopsy. A diseased liver might not be able to clot properly, and a biopsy could cause hemorrhage into the abdomen. A dog that excretes stool without normal pigmentation could indicate liver disease. It occurs when there is obstruction of the biliary system and normal bile pigments are not secreted to cause the normal dark color of stool. An enlarged liver on a radiograph is called hepatomegaly, an abnormally small one is called microhepatica. Either one can be a sign of a liver problem. In addition to plain radiographs, contrast media can be put into the arterial or venous system to help outline the liver. These tests go by various names; cholecystography, portal venography, and hepatic arteriography. The liver in this radiograph is enlarged because the edge of the liver is protruding far beyond the last rib. The edges of this liver are very sharp and clearly outline its borders. This radiograph also shows hepatomegaly, but in this case the borders of the liver are not as sharp. This could be due to a swelling of one of the lobes or fluid in the abdomen. An enlarged spleen can look like this also. Some radiographs of a liver with hepatomegaly don’t show the routine shape of the liver lobes. This case of a liver cancer has a very rounded appearance. A tumor of the stomach, spleen, or intestines can also have this appearance. Sometimes we diagnose hepatomegaly or microhepatica indirectly by looking at the angle of the stomach This picture shows the angle of the stomach in a normal radiograph of the abdomen. Compare it to the radiograph below. This enlarged liver is pushing the stomach (S) towards the rear, an indication of hepatomegaly, even though it is difficult to clearly see the liver. Sometimes we can not say for sure whether an enlarged organ on a radiograph is the liver. This mass, located near the liver, could also be an enlarged spleen, small intestine, lymph node, stomach, or even pancreas. Ultrasound is highly beneficial in the diagnosis of liver disease. We recommend ultrasounding a liver when the liver enzymes tests are elevated over time, or the bile acids test is abnormal. Ultrasound has replaced exploratory surgery in many cases because it is less expensive, far less invasive (all we need to do is shave the tummy) and highly accurate when performed by our radiologist Ann Reed. The internal structure (called parenchyma) can be analyzed, and post-hepatic liver disease can be differentiated from hepatic liver disease. This can be very important because disease in the liver can often be diagnosed with a biopsy during the ultrasound. Post-hepatic liver disease cannot easily be diagnosed in this matter. Instead it is diagnosed and treated with an exploratory surgery (called a laparotomy). This liver ultrasound reveals a mass in the liver. Can you see its circular appearance at the arrow? It also shows abdominal effusion (this is the ascites described previously). When there is a serious problem with the gallbladder it needs to be removed. This requires the expertise of an experienced surgeon because the gall bladder is so closely associated with the liver. Our surgeon is using a sterile Q-tip to gently dissect the gallbladder away from a lobe of the liver. Click here to see the full surgery. Our next page on Liver Disease shows graphic pictures of a surgery. You can skip this section and continue on to routine medical treatment of specific liver diseases by clicking here.